Miley Cyrus breaks down in tears during a performance of 'Pablow the Blowfish' an ode to her dead pet. 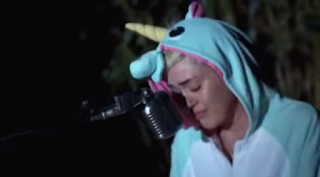 Miley Cyrus has written a song about her dead fish. The 22-year-old singer, whose pet blowfish Pablow died in February, broke down in tears while performing the track she wrote about him during her latest Backyard Sessions showcase.